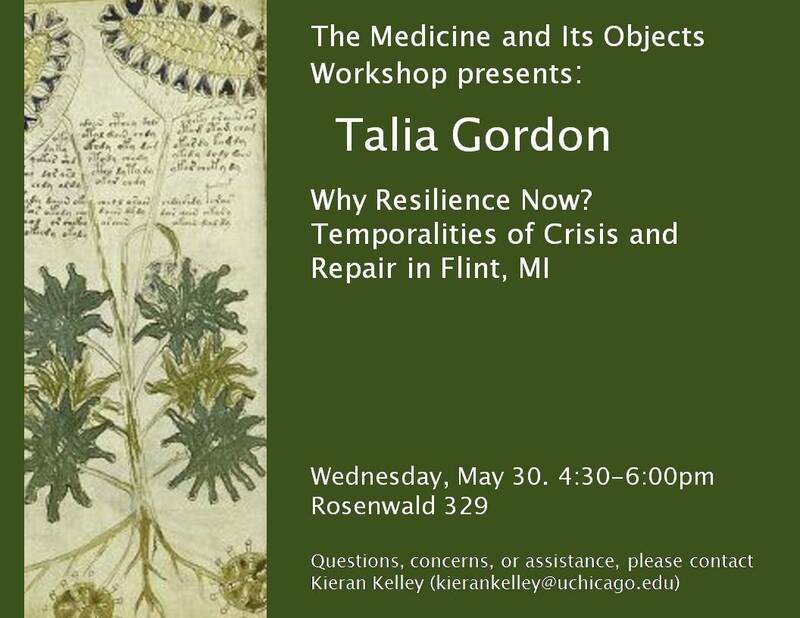 Please join Medicine and Its Objects for our final workshop of the year! In 2014, the drinking water in Flint, Michigan, became contaminated with unprecedented levels of lead, sparking a public health crisis. The contamination drew national attention to the devastating effects of decades-long social and economic decline, broken infrastructure, and the continued disinvestment by state and federal administrations in an already disenfranchised community. In response to the crisis, the United States government has invested federal aid in building “resilience” in Flint. Indeed, in recent years, resilience – the capacity to withstand, recover from, or adapt to adversity – has become nearly ubiquitous as a strategy for enabling communities to respond to the effects of crisis. Yet, the investment in resilience holds perplexing social and political implications for the ways in which experiences of adversity are managed by Flint residents, local officials, and the state. The ascendance of resilience, I hypothesize, expresses shifts in the social and political foundations that give structure and meaning to experiences of adversity, recovery, and belonging in the United State’s post-welfare era. Please join us for this final workshop of the year! Refreshments will be served, and there will be an end of year party immediately following. To receive the paper, or if you have any questions or require assistance to attend, email the MaIOW coordinator: Kieran Kelley (kierankelley@uchicago.edu).